run into clients that are not regularly eating breakfast. Breakfast is the most important meal of the day! Just like most of you my schedule is hectic and limited. At least two days a week I’m out of the house by 6 am and do not return before 8pm. It’s imperative that I start with a healthy breakfast so keep me going on those 14 hour days. I often start the other 5 days with a 60-90 minute workout heavy on weight lifting. So how do I do it? How do I have time to make such a complete breakfast? What do I eat before/during/after workouts? I often get asked by clients and friends alike what goes into my protein shake. So here are the answers. Base: I keep it simple and easy and start with water. Depending on the amount of frozen ingredients I’ll use between 4-6 oz of filtered water. If I’m making the shake for my husband or company I’ll sometimes substitute some of the water for coconut or almond milk – just to mix it up a bit. Veggies: I like frozen broccoli, kale and spinach as my go to. Honestly, you can throw almost anything into your shake (if you have a vitamix like we do) and it will blend fully and silently make your shake crazy healthy. If you have veggies from last night’s dinner leftovers or ones that are about to turn bad throw them in as well! Fruit: Don’t get carried away here. I will add 1/4 of a cup of frozen blueberries and 1/2 a banana at most to my shakes. If I’ve made a salad the night before and only used 1/2 an apple I might throw that it. I try not to add too much sugar here, so limit the amount of fruit you’re adding. Pro-Active Power Greens: a powdered greens product loaded with energizing phyto-nutrients, certified organic wholefoods and plant extracts, including pure spirulina, chlorella, certified organic goji, certified organic banana, broccoli and cauliflower. Pro-Active Probiotic Complete: hypoallergenic blend of 12 certified probiotic species offers the most complete spectrum of microorganisms for individuals seeking higher amounts of several types of probiotics. Omega Superb: contains a stable combination of EPA and DHA as well as astaxanthin for added antioxidant support. Immucare II: Immucare II® supports key systems in the body responsible for maintaining a healthy immune system, including the liver, digestive tract, endocrine glands and spleen. Botanical Treasures: delivers broad spectrum antioxidant activity to quench free radicals, thereby normalizing gene behavior and supporting healthy aging. Colostrum: Increases energy and stamina, lean muscle mass, activates fat metabolism, and returns our body to vibrant health. 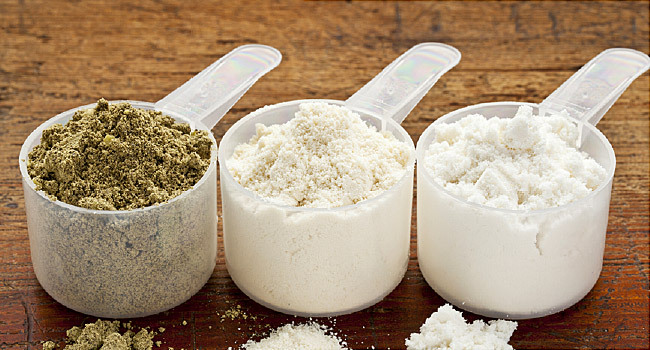 Protein: I vary my protein intake between whey and vegan products. They both have their individual benefits so if you’re not opposed to animal protein sources I highly recommend having both on hand and alternating them each day. When making your shake be sure to add the protein last and make sure everything is well blended prior to adding the protein in as to not alter the structure of your protein powder by blending it up too much. Keep watching our other blog posts for what to look for when choosing a protein powder, why probiotics are beneficial and all the different uses for colostrum!